In a city saturated with restaurants, lounges and bars, we’re truly spoiled for choice when dining in Dubai. 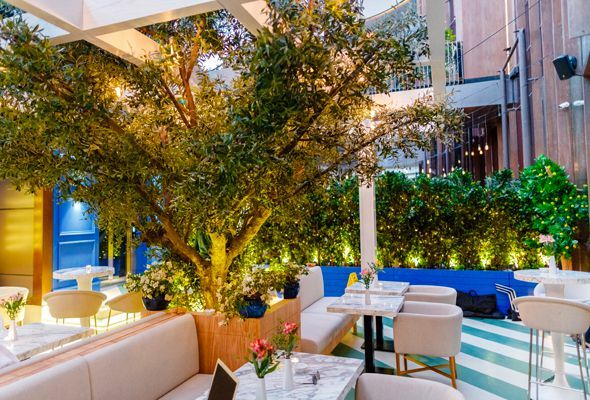 But if you’re looking for a real treat – whether it’s for date night, wowing visitors or you’re just wanting to make all your mates back home jealous of your life in Dubai – we’ve rounded up some of the city’s most stunning restaurants that everyone needs to try at least once. 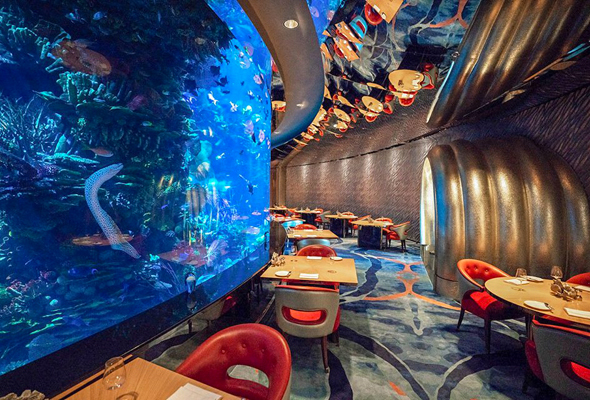 Inside Dubai’s 7-star hotel you’ll find seafood restaurant Al Mahara, which was elevated by the arrival of Nathan Outlaw in 2016, the British chef behind the two Michelin starred Restaurant Nathan Outlaw on the Cornish coast of the UK. Although not based at the restaurant full-time, Outlaw curates the menus, which are heavily focused on seafood and feature an array of his signature dishes, as well as an array of shellfish on ice. The restaurant is striking – accessed through a gold tunnel, restaurant tables line an impressive aquarium, and we’d recommend bagging a table waterside every time. Tasting menus will set you back between Dhs995 for food only and Dhs2,945 with a wine pairing, although there’s an impressive a la carte menu too. While it dedicates an entire side to oysters and caviar, it’s a more concise offering of 8 or so starters and mains, which feature some world-class dishes such as hand dived scallops with apple tartare, wild turbot with seaweed mash potato and chilli king crab in the shell with coconut rice. 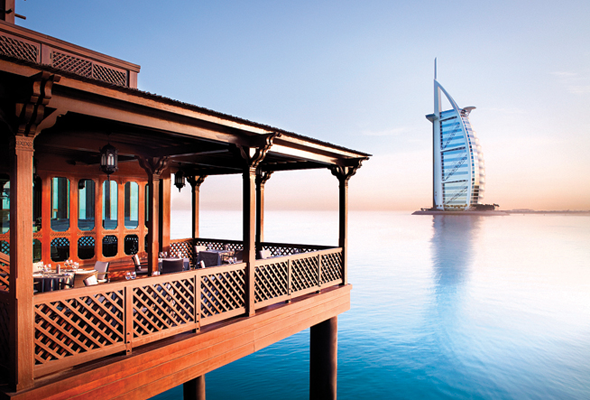 Perched on the end of a pier off the beachfront of Dubai’s luxury Jumeirah Al Qasr resort, Pierchic serves up the wow-factor before you’ve even arrived. During the day, you’ll be greeted by panoramic views across the sparkling gulf, while at night, it’s a short walk or buggy ride up the pier with twinkly lights to guide your way. Once you’re inside, it’s fine dining and creative cocktails on the menu, served up in everything from gold pineapples to brass mermaids. Unsurprisingly, the focus here is seafood and sustainable produce, and dishes on the menu won’t be available unless the freshest catches can be served. From oysters and caviar to fresh lobster and jumbo prawns, a three-course set menu starts from Dhs350 for lunch or an early evening dinner, or from Dhs595 for the Friday brunch. 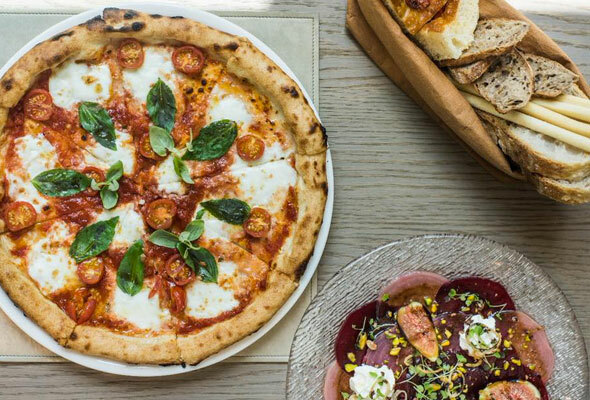 Tucked away on the ground floor of the Restaurant Village at Jumeirah Four Seasons is Scalini, an Italian restaurant brought to Dubai by way of London. The quaint restaurant is littered with pictures of celebrities who’ve frequented the London haunt, while an outdoor terrace is covered in leafy foliage and a central tree twinkles with fairy lights. The real shining star at this restaurant, though, is the staff, many of whom who’ve come to Dubai from the award-winning London spot. They’ve mastered fine dining in a refreshingly modern way, silver serving dishes of fresh beef carpaccio and creamy burrata while laughing and joking with guests. The menu is thoroughly authentically Italian, with each dish full of flavour and beautifully presented. What makes Il Borro so special isn’t its stunning views (although it does have a lovely terrace that looks out to the waters of Jumeirah Al Naseem), nor its contemporary interiors which still manage to feel intimate. What gives Il Borro the wow-factor is its dedication to serving authentic Italian fare, made with Italian sourced products. Il Borro is drenched in history, and the Italian restaurant hails from a famous Tuscan estate which has more than 1,000 years of rich history, and is set amongst a sprawling 700-hectare estate. While its modern Dubai outpost may be world’s away from its Tuscan home, the team behind What’s On’s Restaurant of the Year 2017 remain dedicated to creating a taste of Italy in Dubai, and do it to an unfalteringly high, and arguably Michelin-worthy standard. 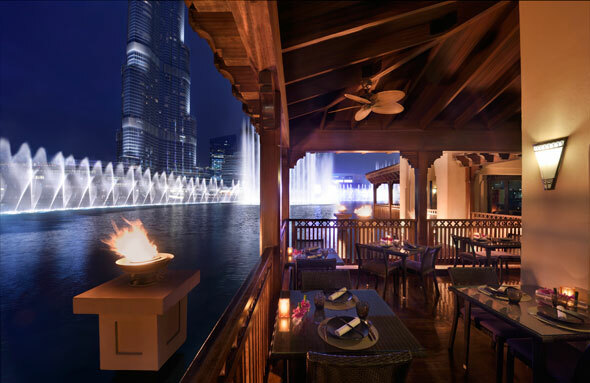 At the waterfront of the Palace Downtown is Thiptara, a Thai restaurant and terrace surrounded by Burj Lake. Out on the terrace which laces round the restaurant, you’ll find what is arguably the city’s best view of the Dubai Fountain. Perch up against the balcony to tuck into a menu of home-made Thai dishes, which range from traditional Bangkok street food dishes such as satay and steamed dim sum, to Thiptara specials including Phad Char Soy Shell – a spicy scallop dish loaded with flavours in an oyster sauce. The whole menu is created by the Thai chef, and you’ll be able to make your way through the menu to the sounds of Dubai Fountain’s dramatic shows. Want to see the city from 122 stories in the sky? 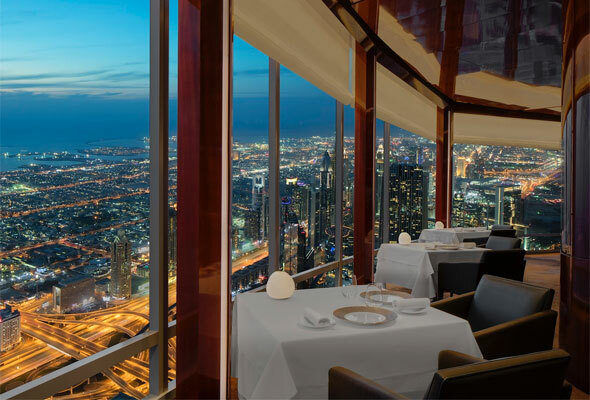 You’ll want to make a reservation at At.mosphere, the city’s tallest restaurant. It serves up some stunning views as far as the eye can see, with Arabian Gulf views from the lounge side and Downtown Dubai serving as a backdrop to diners in the restaurant side. But it’s not just the views that are wow-worthy at this sky-high dining experience – its modern European menu is served up for breakfast, lunch and dinner in the restaurant, with an elegant afternoon tea available in the lounge during the afternoon, and an upscale a la carte lounge menu and expert cocktail list available until late night. While a seven-course tasting menu may set you back Dhs980 for food or Dhs1880 with wine pairing, you can experience a slice of At.mosphere’s stunning views for a fraction of that price if you’re female – a bottle of bubbly and complimentary canapés is available at their daily ladies’ night from 9.30pm to midnight every day for Dhs120.